Combine flour and salt in mixing bowl. Cut shortening into the flour with a pastry cutter, until mixture resembles the texture of tiny split peas. Do not use your hands to try and mix it, the heat from you hands will melt the shortening, causing the pastry to be "heavy", not light and flaky. Once mixture is the right texture, add the ice water and combine with a fork. It may appear as if it needs more water, it does not. Quickly gather the dough into a ball and flatten into a 4-inch-wide disk. Wrap in plastic, and refrigerate at least 30 minutes. Using a floured rolling pin, roll dough disk on a lightly floured surface from the center out in each direction, forming a 12-inch circle. For a Recipe Using an Unbaked Crust: Proceed as directed. 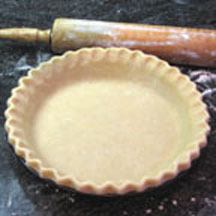 For a Recipe Using a Single Baked Crust: Prick dough thoroughly on the bottom and sides with the tines of a fork to help prevent it from blistering and "puffing up" as it bakes. Bake in a preheated oven at 425°F (220°C) for about 15 to 18 minutes, or until light golden brown. Cool before filling. Proceed with recipe's directions. *During winter months, flour can become "drier", you may need to add more water, about 1 teaspoon or so per single recipe, but not much more. **For best results, always use a premium brand of shortening, such as Crisco®. Nutritional Information Per Serving (1/8 of recipe. ): 188.9 calories; 60% calories from fat; 13.0g total fat; 0.0mg cholesterol; 118.0mg sodium; 22.2mg potassium; 15.9g carbohydrates; 0.6g fiber; 0.1g sugar; 15.3g net carbs; 2.1g protein. Crisco® is the registered trademark of The J.M. Smucker Company.